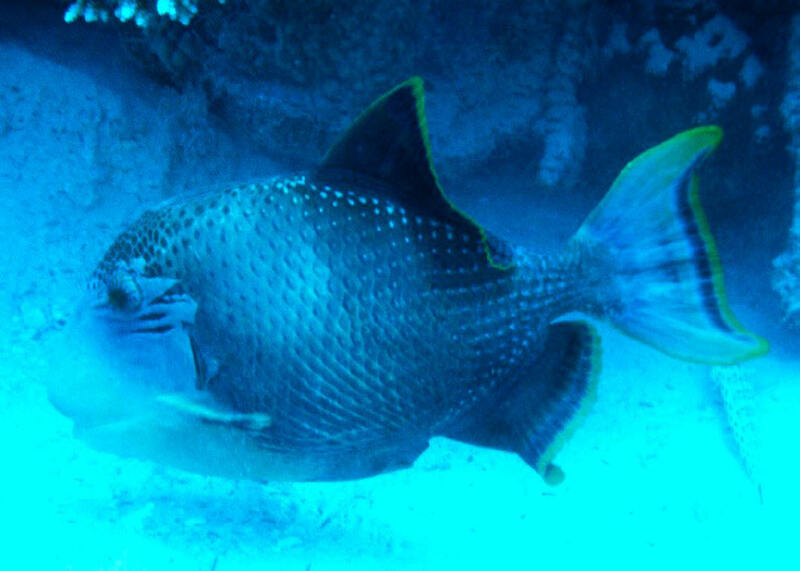 Most wholesalers offer two species of Melichthys more or less continuously, the circumtropical Black (Durgon) Triggerfish, Melichthys niger (Bloch 1786) (usually out of Hawai'i), to eighteen inches. One in Roatan. Yellow Fin, Margin or Face Triggerfish, Pseudobalistes flavimarginatus (Ruppell 1829). 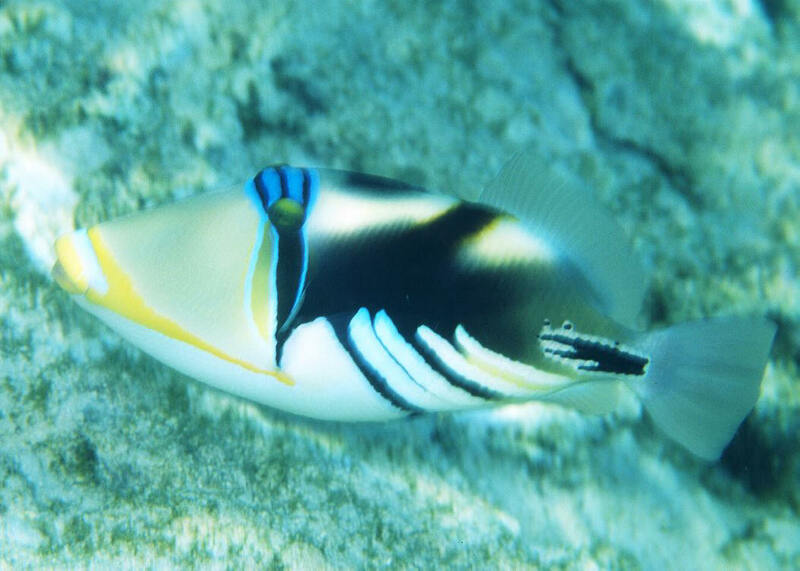 A beauty and peaceful for a triggerfish when small. To two feet. Indo-west Pacific, Red Sea to along Africa's eastern coast to Natal. Here a subadult in the Andaman Sea off Thailand. 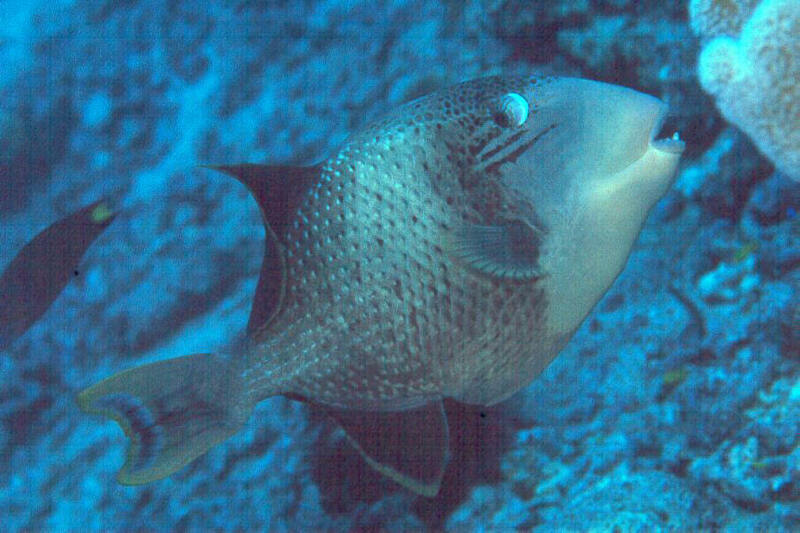 Yellow Fin, Margin or Face Triggerfish, Pseudobalistes flavimarginatus (Ruppell 1829). A beauty and peaceful for a triggerfish when small. To two feet. Indo-west Pacific, Red Sea to along Africa's eastern coast to Natal. 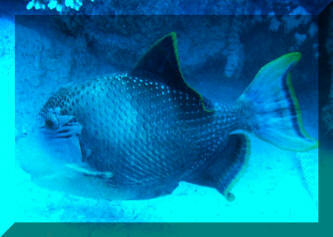 Here an adult in the Red Sea. The most popular Rhinecanthus species is immortalized in the song of none other than Don Ho himself. This is the Humuhumu nukunuku apua'a (literally "water pig with a needle" in Hawaiian, in reference to grunting noise they make and their spiny dorsal "trigger"), AKA the Picasso or Lagoon Trigger (aka the "Blackbar" to science), Rhinecanthus aculeatus (Linnaeus 1758). A juvenile in Aitutaki, Cooks Islands.